Heat together the maple syrup and rapeseed oil to 40° C.
Beat in the sugar and mix well. Then add the melted cold vegan butter. Then add the flour’s and salt and beat to ensure it is fully combined. Spray a light coat of oil onto the pre heated plate. Take a large scoop of the batter and place in the centre, close the machine. Bake for 30 to 60 seconds until golden brown, cut to get 3 cones per full disk and then shape in the mould. Repeat the process until you have used up all the batter and allow the cones to cool. In a separate bowl, mix together all the other oats, nuts and seeds. Pour over the hot syrup and mix very well. Pour onto a lined baking tray and bake for 20 to 25 minutes at 140° C, turning regularly. The granola should be light brown in colour and crunchy when ready. Once the granola has cooled, add the cocoa nibs, strawberry pieces and mix well. Reserve for finishing the cones. Melt both together and temper. 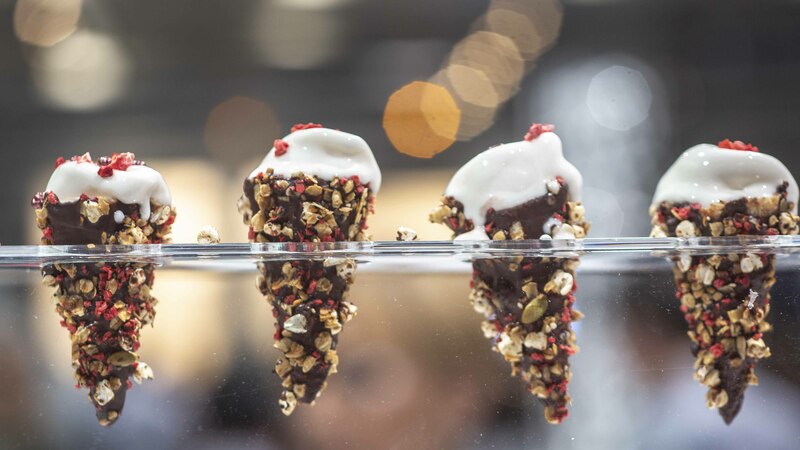 Use at 32° C to dip the cones to the top rim, shake off the excess and then sprinkle with granola. Allow to set at room temperature and store in an airtight container. Heat 150 g of the cacao juice with the water to 70° C.
Reserve the other 150 g of juice. Mix together the sugar and inulin and add to the hot liquid whilst continually blending with a stick blender. Add the chocolate to the hot liquid and emulsify. Finally add the reserved room temperature cocoa juice and finish to emulsify. Pour the creamy mixture into a tray, cling film the surface and chill in the fridge for at least 12 hours. Transfer to piping bags ready for use. Wash the strawberries and remove the green. Dice into 5 mm cubes and then season with lemon juice and a little sugar to taste and leave to marinate for 10 minutes. Add the puree and reserve in the fridge for assembly. Mix together the sugar, inulin and guar gum. Using a stick blender, blend the powder mixture into the water and cacao juice. Chill and allow to rest for 30 minutes in the fridge. Blitz again to liquefy before churning using liquid nitrogen. Serve when ready. Temper some chocolate and spread onto hexagon plastic stencils. Sieve over freeze dried strawberry powder and allow to set. Break into random shaped pieces to make decorations for the cones. Layer the chocolate creamy and strawberry salsa in the cones. Scoop some cacao juice sorbet on the top. Add chocolate decorations, cocoa nibs and freeze dried strawberry pieces and serve immediately.